A link detached family home in sought after development on the outskirts of Rye and overlooks the High Weald Area of Outstanding Natural Beauty. Comprising of the modern lounge, fully fitted kitchen with integrated appliances, spacious diner/conservatory and downstairs cloakroom. On the first floor there are three bedrooms one with en-suite, and a family bathroom. 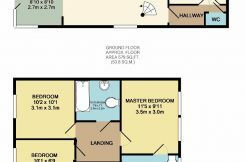 There is plenty of storage space with an under stairs cupboard and a great size airing cupboard on the first floor. Underfloor heating downstairs and radiators on the first floor. All in fantastic condition with a solid wood flooring, and white wooden Sanderson blinds throughout both floors. Situated in a quiet road with views of the unspoilt countryside. Front and rear gardens laid to lawn. An off street parking space leading to a car port. Together with being nestled within acres of private parkland which includes a footpath network and children's play area makes early viewing a must.